The art of asymmetry. 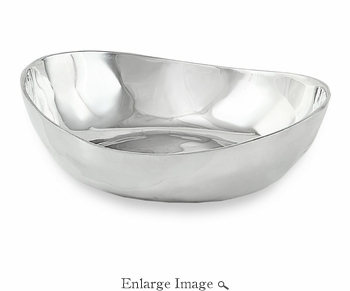 The SOHO Medium Galaxy Curved Bowl is a feast for the eyes with its artistic design, and brilliant hand-polished surface. Distinguished by a free flowing form, with dimples that catch the light, it is adds depth and dimension to any table. Perfect for casual entertaining. Makes a lovely gift. Made of a top quality, FDA safe, easy-care, oven and freezer friendly aluminum alloy.